Say the words “pork belly” and the eyes of any foodist will light up. That’s what happened when I read the words “crispy braised pork belly” on the recently updated menu at the venerable Gastown gastropub The Irish Heather. I had to have it. North American foodists know pork belly. We’ve just come through what seemed like a veritable “bacon wave” in popular cuisine. Obviously the myriad kinds of cured and smoked pork belly from many cultures form a staple in our foodists diet. Imagine cooking without bacon, pancetta or lardons where called for. Disaster. Cured pork belly is even described by some as being addictive due to it’s complex umami characteristics. Thanks to the creativity-inspiring cultural melting pot of urban restaurants, uncured pork belly dishes have started appearing on menus in establishments that previously would not have served it. This is a good thing because, done right, it is an amazing cut of meat. Global preparations of this cut are diverse. Pork belly both crispy roasted and slowly braised are a glorious part of Chinese cuisine. Korean cuisine features grilled pork belly with kimchi in lettuce wraps. The classic Italian porchetta involves wrapping the uncured, skin-on pork belly around the loin or shoulder and roasting. There are many more examples of how pork belly is eaten uncured around the world. Let’s be clear; pork belly is not something you want to eat every day (well maybe you want to but you really shouldn’t). It starts off as 92 percent fat and 8 percent protein. Cooking renders some of the fat, but this is still a very fatty cut. Preparing it so the fat content doesn’t overwhelm can be a challenge. Preparing it so it is pleasing to the mouth takes patience. I didn’t quite know what to expect. I hadn’t seen the dish come out yet as part of another customer’s order, so I was ordering blind. 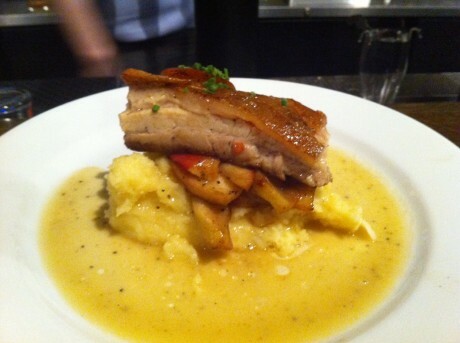 The menu promised “crispy braised pork belly, apples, potato purée, whiskey jus”. And there it was, just as advertised in all its simplicity and deliciousness. Each of the four elements prepared with a preciseness that made for an elegant whole. The pork belly was tender and sticky with a great mouth feel. A last-minute sear added some contrasting texture by crisping the outer layer of the skin. This is not crackling by any means (you have to roast it to get that sweet, sweet candy) but rather a light crusting on otherwise tender pork skin. I’ve seen pork belly go sideways due to not being braised or roasted long enough, which leaves it tough and stringy. Not so here. The time and attention required was evident in this right-sized portion of succulent porcine protein. Under the pork belly were some nice cooked apple slices which added both sweetness and acidity to the dish. The potato puree was both smooth and substantial. The whiskey jus did indeed have a solid hint of Jameson’s but not enough to overwhelm. The jus helped everything hang together nicely. The simplicity of this dish is truly one of its great features. In spite of the cut being somewhat unusual, there is also a comforting familiarity to it. It is at the heart of it a pub dish. I couldn’t help but think I was eating a very modern and elegant version of bangers and mash. I recommend you try this dish.